The Actors Chewdio was established in 1984 by founding members (and legendary thespians) Francois Van Varenberg, Charles Buchinsky, Michael Gardenzio, Kurt Vogel, and Thomas Mapother. Since its inception, The Actors Chewdio has been a shining beacon of quality within the acting community; producing exemplary performers at a level of talent and professionalism that all others aspire to reach. The organization is lead today by Chairman Hans Lundgren and it is with his gratuitous blessing that we bring you this procession of literary specimens aimed at enlightening lesser folk to the entire cinematic history of the craft’s innumerable transcendent masters…one film at a time! The Film: The Outsiders (1983) Director: Francis Ford Coppola Writers: Kathleen Rowell, Francis Ford Coppola (uncredited) Based on the novel by S.E. Hinton Thespians: C. Thomas Howell, Ralph Macchio, Matt Dillon, Diane Lane, Rob Lowe, Patrick Swayze, Emilio Estevez, Tom Cruise, Glenn Withrow, Leif Garrett, Darren Dalton, Michelle Meyrink, Tom Waits, Gailard Sartain, S.E. Hinton, William Smith, Sofia Coppola, etc. Running Time: 114 minutes (The “Complete Novel” version) Budget: $10,000,000 Theatrical Performance: $25,697,647 [caption id="attachment_131098" align="aligncenter" width="547"] Stop cryin’, sissy! PAIN. DON’T. HURT. [/caption] Tom Cruise in a period piece ensemble? And not even in a main role at that? Say it ain’t so! Well, it is. Ole Thomas is saddled with the very hickish minor character Steve; Sodapop’s (Lowe) short-tempered best friend. Our main men, as it were, are Ponyboy (Howell) and Johnny (Macchio). They receive a hefty amount of support from the likes of Dallas (Dillon), Darrel (Swayze), Cherry (Lane), Two-Bit (Estevez), and the aforementioned Sodapop. Our tale takes place in the town of Tulsa, Oklahoma circa 1965. Our glorious pack of misfits are the town’s Greasers. Naturally, like any gang worth their salt, they have a beef with the more financially-privileged “Socs” (pronounced “so-shez”). Anytime a gang rivalry is in play, it’s always the little guys that get catch the brunt of the abuse. Ponyboy (and to a lesser degree, Johnny) get a lot of hell from the Socs and even more from their own group for not standing up for themselves. So one night they finally do; resulting in Johnny stabbing Soc Bob (Garrett) to death in an effort to save Ponyboy. After some bad advice from resident self-destructive bad boy Dallas, they go on the run. How far do they run? About a town or two over. They take up residence in an abandoned church that has some running water and Johnny goes for supplies with some money that Dallas gave them. What does he come back with? Sliced bread and a week’s worth of bologna. Real smart, Johnny. I’m sure it will last wonderfully in the heat. One of them also decides to trim and dye his hair. Common sense would say that the one that did the murdering be the one to change his appearance, right? Well you can just throw that out the window. We’re talking about pre-teen boys here. Instead of an appearance-altered Johnny, we get a bleach blonde short-haired Ponyboy. And yes, it is a sight to behold. The two of them spend the next few days eating nothing but bologna while Ponyboy reads Gone With The Wind out loud for their mutual enjoyment. He also quotes Robert Frost. And cries a lot. In fact, he’s pretty much an emotional wreck throughout the entire film. After an accidental fire at the church that leaves Johnny horribly burned and holed up in the Tulsa hospital, things come to a head between the Greasers and the Socs. This culminates in a huge rain-drenched muddy brawl between the two groups where things are fairly equally matched, with practically everyone giving as good as they get. 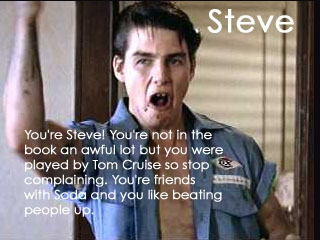 Except for resident brawler Steve (The Cruiser), who appears to wipe the floor with whoever he can get his hands on. Outside of a few random lines with his surprisingly impressive country accent, this is Tom’s true moment to shine. His cocky fight-happy character is a fun one during his few sequences within the film. As I said before though, this is more of an ensemble piece and Tom’s Steve is not one of the main characters. Why then, did he take the part? CC: How did you make the transition from Losin’ It to working with Francis Ford Coppola on The Outsiders? TC: I learned the things I wanted, and the things I didn’t want. I got a new agent and thought, “I have to work with good people and good directors and grow.” I heard about the movie, and I came out to Los Angeles and stayed at Emilio’s [Estevez] house over Christmas. And I stayed at the Penn’s house in the summer. That’s when Sean was doing Fast Times. I just went to Francis and said, “Look, I don’t care what role you give me, I really want to work with you. I want to be there with all these young actors. That was a hell of a good time. I just wanted a wide body of work. After Taps came out I was offered every horror film, every killer-murderer part. I told this one agent that I wanted to work with Francis. He said, “Francis! He’s not going to pay you anything!” It was never a main role, but I created something. That was where I learned I had a sense of comedy. I still want to work with Francis again. 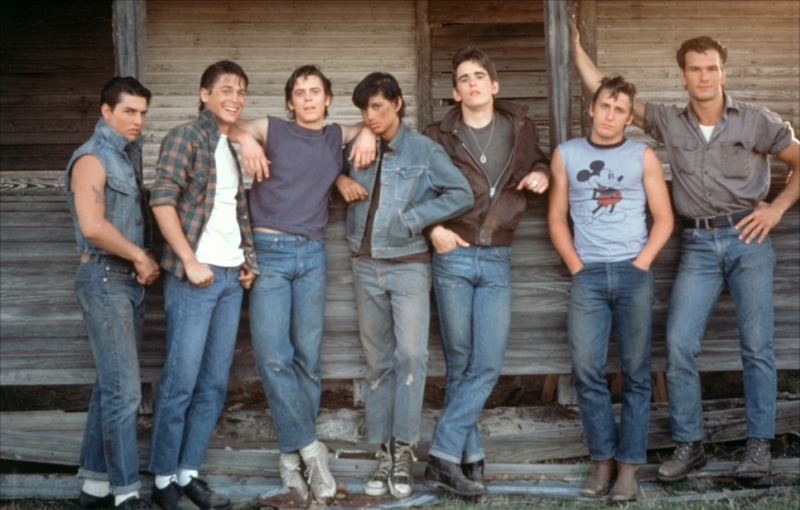 (Left To Right – Cruise, Lowe, Howell, Macchio, Dillon, Estevez, and Swayze)[/caption] What Sayeth Humanity? 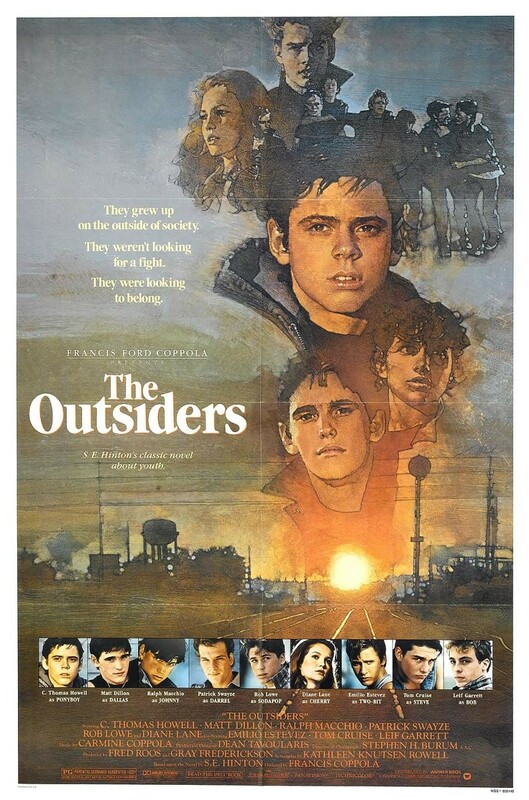 : Despite receiving a somewhat lukewarm reaction upon its release, The Outsiders has maintained a fairly good reputation in the years since and is still shown in classrooms as an accompaniment to the Hinton’s novel to this day. It is actually the latter action that prompted Coppola to finally go be and reinsert the 22 minutes of footage that was in his original cut, but removed at the request of the studio to trim down the running time. The film tends to rarely come up on the subject of Cruise, but given his supporting role that is no surprise.